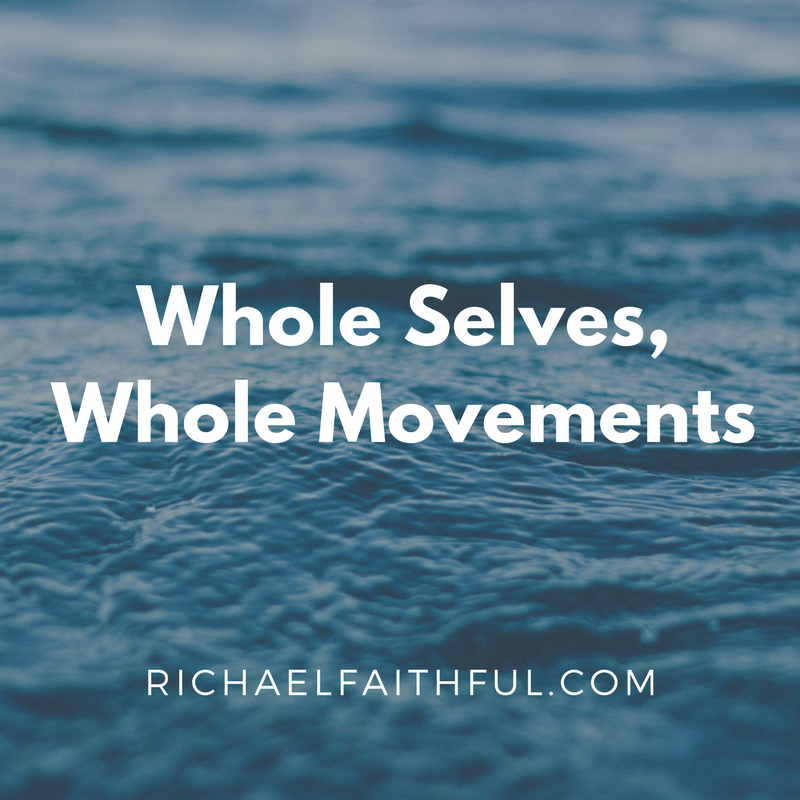 Whole Selves, Whole Movements is a five event healing justice series by Richael Faithful. Whole Selves, Whole Movements was developed under the rationale that activists should understand the fundamentals of healing justice, which, in part, captures the ways in which people with histories of individual and systemic trauma learn to survive marginalization. Designed as a dynamic curricula, Whole Selves,hole Movements, can support staff in their own care as activists, and provide additional tools to help support activists, and the communities that they support. Healing justice, as a philosophically-grounded political orientation, intends to prepare, support, and maintain the well-being and wholeness of justice movement ecosystems. It is the “healing inside liberation” that makes the prospect of liberation for all of us even possible. Whole Selves, Whole Movements is designed to provide a comprehensive, experiential understanding of healing justice framework and its complex applications. Each workshop will integrate a basic structure that includes an opening (series goals for the first session, content review for the remaining three workshops), primary content, and brief closing/resource overview. The series is primarily designed for in-person workshops, however, can be adapted for in-person/remote participation, and as a virtual experience. The series will also contain a graduated/late-entry curriculum, which means that each workshop will build on the content of previous workshops, however, each subsequent workshop is also longer to allow for brief review of content fundamentals, for newcomers and returning participants alike. The design balances an incentive for participants to join all five workshops, and an acknowledgement that attendance to all trainings may not be possible. The series is structured to generate an ongoing learning experience from launch to close. Therefore, it is recommended that workshops are scheduled no more than 8 weeks apart (6 weeks is preferable except between the second and third workshops) with the Continuation Curriculum serving as a bridge through the series. As the workshops are content rich, and graduated, the series design encourages consistent and deep engagement, and facilitates a continuous learning experience over several months. Groups will have an opportunity to provide feedback for further customization and suggest other minor changes during the series finalization phase before the launch of the first workshop. This introductory workshop will use a popular education model, through the tools of multimedia, breakout groups, and interactive graphic recording, to form a foundational understanding of the healing justice framework in two parts. First, participants will learn about the recent history of the healing justice movement, including its re-emergence over the last decade, particularly in LGBTQIA+, disability rights and activist arts movements. After developing a shared understanding about the framework and history, in the second part, participants will learn common healing justice principles, and notable groups/collectives at the vanguard of healing justice today. The purpose of this introductory workshop is for participants to gain a deep appreciation for healing justice as a philosophical orientation upon which the other three workshops are based. The purpose of this workshop is to demystify often confused concepts of care and healing, and to understand how these concepts translate to groups, culture, and society. This practical-level workshop is an entry point into the connections among individual well-being and liberation, and collective well-being and liberation. It provides a multi-activity reflection space for participants to distinguish among key concepts--self care, higher care, culture of care, discomfort, harm, and trauma, rupture and repair, healing, restorative and transformative justice--and these concepts’ application in their lives. Together, participants will identify their personal and group areas of skill, and growth edges. The purpose of this workshop is to help participants apply a healing justice framework onto their own experiences, and examine the health and impact of their own well-being/wholeness ecosystem in the work that they do. This sharing-based workshop passes on lessons learned about the ways that people whose livelihoods is to support others, and other people in solidarity, and caregivers, heal from secondary trauma. In the space, participants will engage in dynamic diagramming to develop a shared definition of, and understanding about, elements of vicarious trauma. They will also be part of an interactive assessment, within the group, about their exposure, experiences, and current capacities, as people who encounter others’ trauma. Most of the workshop will be dedicated to learning release and discharge practices, boundary-setting role play, and sharing other effective self/group care strategies for maintaining well-being in support roles. The purpose of this workshop is to deepen participants’ application of healing justice framework in their own lives that requires a generational lens to analyze harm wrought by power structures into which we are born, and by which we and our communities are impacted over extended periods of time. MHB is a workshop designed to support participants identify inherited negative patterns of being; learn how these negative patterns intersect with systems of oppression; and create a preliminary blueprint for deep healing at root levels for participants and ecosystems that they inhabit. MHB uses body-based awareness to reveal the nature and quality of harm that we carry; narrative medicine to understand the negative cognitive, emotional and energetic patterns that we hold, whether direct or inherited; and mapping tools to reflect our individual and collective ecosystems and healing technologies that we have relied on or have available to us within those ecosystems. This workshop intends to guide participants in their deep exploration of their inherited wounds, and seed prospects for healing at all levels. The purpose of this workhop is to help participants begin to envision and actualize the core of healing justice: how to create and exist in the liberated worlds that we struggle for. It aims to help pivot participants’ orientation from not only what we need to allow to die, but prioritize what we need to seed, and nurture for growth in our futures. This capstone workshop will help participants reinforce affirming beliefs, choices, and other culture-related contributions that affect our ecosystems of being. In an experiential exploration of the question, “what makes us all well?” we will examine a wide range of empirical data (indigenous traditions, scientific research and sociological case studies) to delve into our cognitive patterns, use of language, and other culture-making that allows our ecosystems to thrive. Participants will be guided in a dynamic self-assessment of their culture-making, and have support to envision the contributions that they wish to make. bridge workshops within the Whole Selves, Whole Movement series, and offer further support for group members. Introductory Whole Selves, Whole Movement video. short video message from the series curator introducing the series, and offering a special invitation to for group participation. Workshop Reflection Questions. A set of reflection questions will b provided before the series; weekly after each workshop; and after the series, as part of the series evaluation. Facilitator Q&A Webinars. A 30-minute discussion webinar after each workshop for participants to ask the facilitator direct questions and share reflections inspired from weekly questions. Whole Selves, Whole Movements is a labor of love intended to reach as many people as possible. Therefore, the workhops and optional continuing curriculum are offered on a sliding scale, based on the curator/facilitator’s labor (50 hours for series, 15 hours for CC) and group’s annual budget or resources.